Music Beta by Google, Will It Kill iTunes? I just received my invite today from Music Beta by Google. Going through the process of getting setup, and then installing Google’s new music platform was quite easy and pain free. Something that I’ve come to expect with most Google products. The interesting thing I noticed, and thought was very cool, was that I received something like 450 songs for free. These songs are licensed by Google for the Music Beta platform, and before I loaded a single song I was up and running with a respectable size library of songs. So I proceeded with the install and started the process of uploading my own music. Thing is, I have around 20,000 songs so I was excited to get started to see exactly what Google’s Music locker would do. Surprisingly, the platform scanned all my songs, prepared to upload, then started the process of bringing the songs up. Now I have to admit, with this many songs it’s going to take awhile. And I started the upload process about 7 hours ago and we are still going. But regardless, up to now, it looks like Google is uploading every song I have. Will Music Beta by Google actually kill iTunes? This might be a bit of a stretch, but Google Music has one thing that iTunes currently does not and that is web access to your entire library. With Google Music, when you open the application the platform loads in a web browser, not a desktop app. This gives you access to your music library from any location that has web access – something iTunes currently doesn’t have. And with iTunes song library’s not being accessible online, you are still tied to a single location where you have iTunes installed. 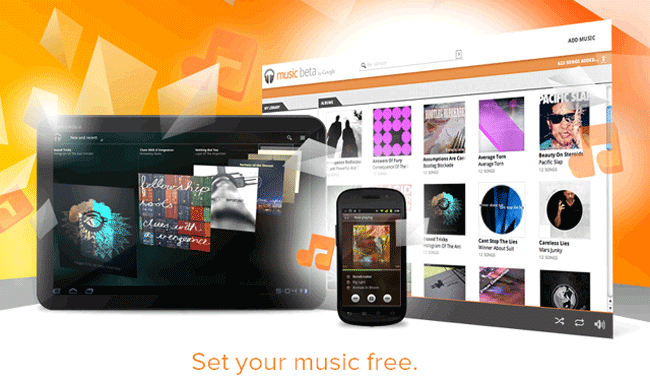 However, with Google Music, you can access your music from any computer, anywhere in the world, so long as you have the web. Now granted, all it would take is Apple to finally launch an iTunes platform online and the playing field would once again be leveled. But until that happens, I’m thinking that Google’s got a pretty strong sales proposition with Google Music. Right now, you can get Music Beta by Google for free. However, according to Google’s statements about the platform, the “free’ness” of Music Beta will not last indefinitely. The exact pricing for Google Music has yet to be released. You can request an invite to Google’s Music Beta by clicking here.